Last week my husband and I took a trip to downtown Los Angeles to see a concert, but beforehand we had to get something eat. The possibilities now for food and entertainment in the downtown area seem to be growing by the day. In fact, the section we were in near Broadway felt to me more like New York than ever. In case you were wondering, we eventually settled on a quaint French place for appetizers and happy hour. Well, not only is the foodie scene growing in DTLA but so is the "wall scene". 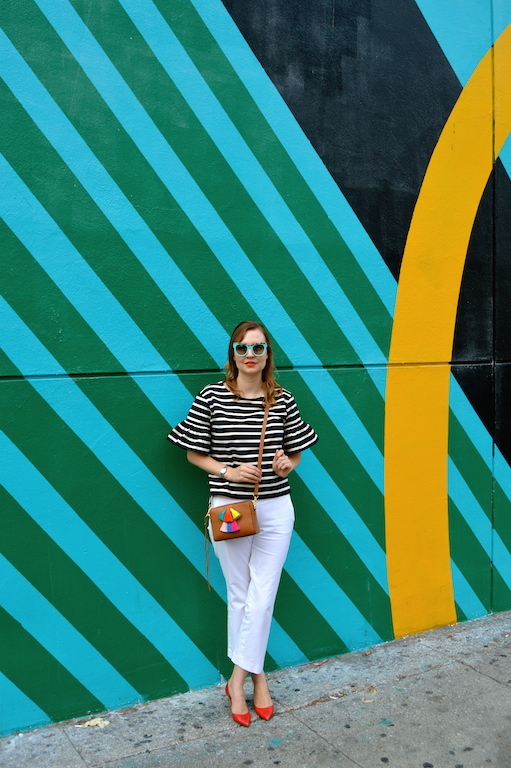 We were walking along trying to find a restaurant and I spied this striped wall from a few blocks away (I have supernatural vision when it comes to walls) in the Fashion District of the city. Once I caught a glimpse of it, I rerouted my husband and said that we had to go check it out. 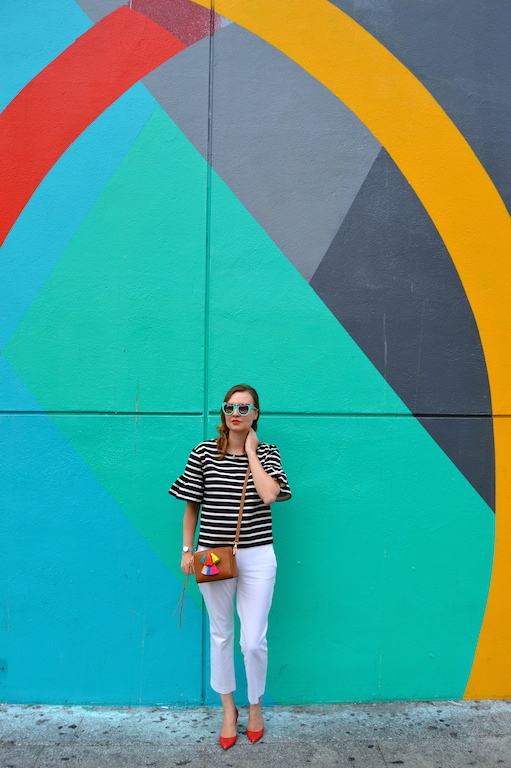 It turned out to not only be a good wall but it was also a perfect compliment to my striped shirt! I've actually had this shirt from J. Crew since it first came out a couple of months ago. I have exactly one million striped shirts in my name, but this one had unique bell-shaped sleeves so I had to add it to my collection. 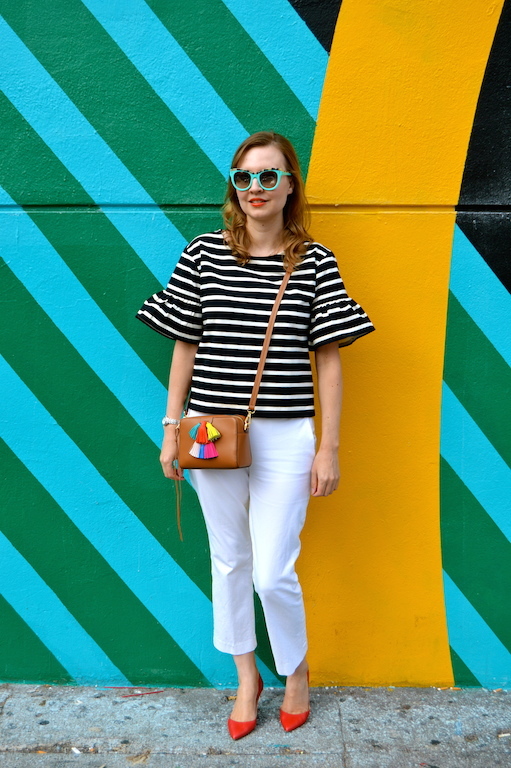 When I purchased this shirt I was so happy to be one of the first people to have it and hopefully to feature it on my blog, but every time I tried to do some photos with it on, something always went awry. So now it's pretty much sold out online (although I think they just restocked it) and in stores and you may have seen it a million times on the blogs of others, but I am glad that I finally found the perfect backdrop for it! As I always say, good things (walls) happen to those who wait. You really do have the best wall radar (wall-dar?) and it was fate that this one complimented your outfit so perfectly. 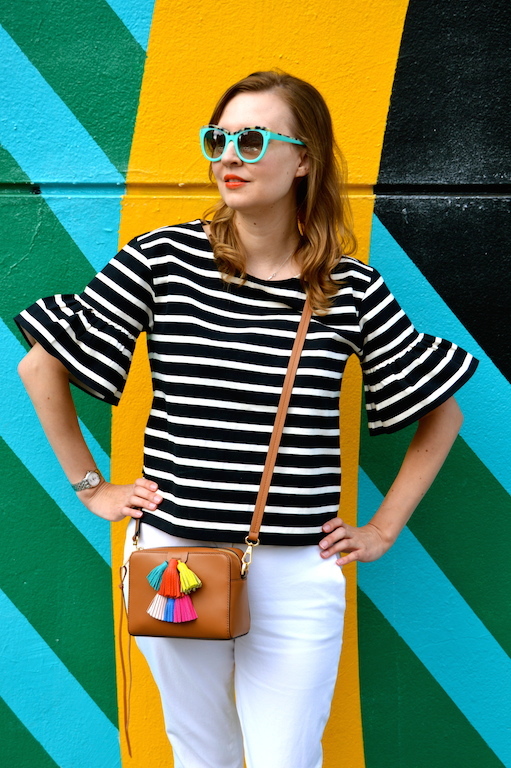 Love the graphic stripes and colorful tassels + shoes!! That is a great wall. 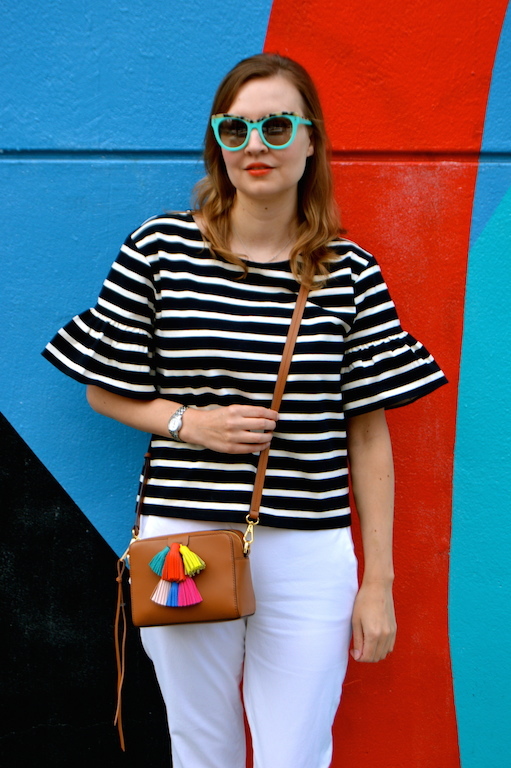 I love the bright wall next to the black and white of your outfit. I really wanted to buy this top but decided against it because I already have very large arms and figured the bell shape won't be flattering on me. I was driving in DTLA the other day and saw so many great graphic walls. Too bad I was working and didn't have my camera or my hubby (the photographer) with me. I love your outfit! 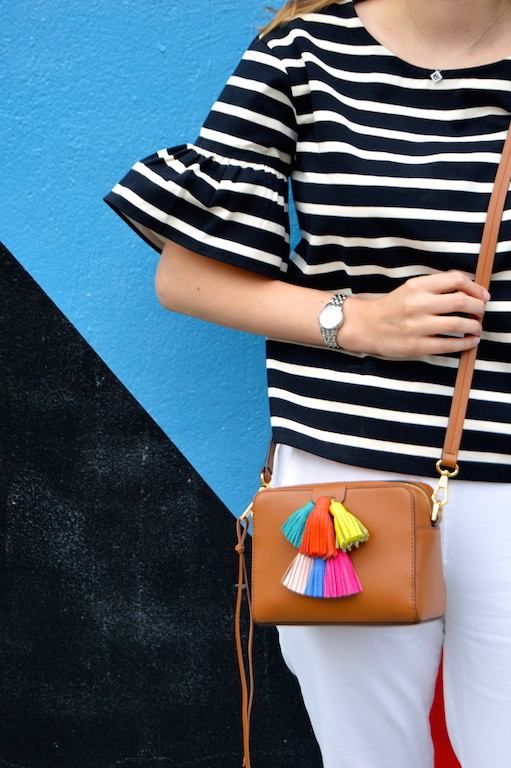 I have such a hard time to say "no" to stripes... The sleeves of yours are too cute! Fabulous background!